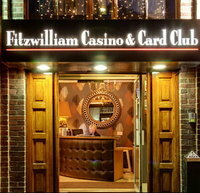 Considered to be the most frequented land based casino in Dublin, the Fitzwilliam Casino & Card Club or the “Fitz”, is situated in the heart of the Irish capital and welcomes players from all over the world to its casino with its relaxing and convivial atmosphere. Concentrating mostly on table games the vast casino also has 6 giant screens showing live sports meetings and different paying events. The club also has a bar restaurant offering a full service every day. However the Fitzwilliam Casino & Card Club stands out from the majority of other land based casinos in the world because it offers online players the possibility to access its gaming tables from their own homes. The Fitz’s vast, comfortable casino is laid out to meet the needs of classic table games fans. There are 2 European roulette tables, 4 electronic roulette terminals as well as several blackjack, Brit Bag (a type of poker with 3 cards) and Punto Banco (a popular version of baccarat) tables. The establishment also has a Poker Room where private Texas Hold’Em Poker tournaments are regularly held. For a few years, the Fitzwilliam Casino & Card Club has been one of the few rare casinos where virtual players can enter just like players who physically travel to Dublin. In partnership with some of the leading publishers and igambling solutions providers, the casino has installed cameras and an array of technological equipment to stream different table games live to its online casino partners. So without leaving their living rooms, online players in these casinos can have a unique gaming experience within the walls of one of Europe’s most prestigious casinos. Everything happens just as if the player was inside the casino because he experiences the atmosphere and can interact with the dealer and see and hear the players who are physically present. As well as saving time and money, this type of gaming isn’t at all restrictive. A virtual player can play while smoking and can wear casual clothing which players arriving physically in the Fitz cannot do. It also gives online players used to RNG systems a chance to play with flesh and blood dealers. Casino Extra : Owned by MTM Corp, this casino offers its players a live casino using Actual Gaming technology which guarantees excellent quality live streaming from the Fitz. Lucky31 Casino : Also belonging to the MTM Corp group, Lucky31 Casino also uses Actual Gaming’s transmission platform installed inside the Fitz to offer a unique live gambling experience. Lucky Live Casino : An online casino from the developer Vuetec, Lucky Live offers the best of this developer’s technology in its fluid and very well stocked live casino. Other names can also be added to this list such as Casino Estrella and Dublinbet which also provide live streaming from the Fitzwilliam Casino & Card Club’s tables. The Fitzwilliam Casino & Card Club is situated in the heart of Dublin, the capital of the Irish Republic. The complete address is: Clifton Hall, Lower Fitzwilliam Street, Dublin 2.